2008 ranked 14th coldest of the thirty years of records for the University of Alabama MSU based lower tropospheric temperatures (right in the middle of the pack). It was the coldest year since 2000. It continues the downtrend of the last 7 years. This compares with the Hadley Center data which (together with the equally alarmist WMO) claims 2008 will rank 10th warmest since 1850. (159 years!). How can an “average year” in one data base appear be a “top 6%” warmest year in another? Well the global data bases of NOAA GHCN, NASA GISS and Hadley CRUT3v are all contaminated by urbanization, major station dropout, missing data, bad siting, instruments with known warm biases being introduced without adjustment and black box and man made adjustments designed to maximize warming (Steve McIntyre found more urban areas had their temperatures adjusted up then down). Also ocean temperatures are an issue with a change in the methods of measurement and incomplete coverage. Hadley uses their own merchant ship data and that covers some heavily travelled routes but has no coverage of the vast southern oceans (the oceans cover 70% of the world’s surface). The biggest issue is station dropout. 2/3rds of the world’s stations, many rural areas in the FSU stopped reporting around 1990. 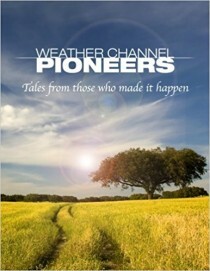 Dr. Kenji Matsuura and Dr. Cort J. Willmott at the University of Delaware prepared this animation. See the lights go out in 1990. The below plot of the NOAA/NASA station count (blue line) and average annual temperatures (brown columns). It clearly shows the big dropoff of rural stations. The animation above shows that Siberia is one area with the biggest change. 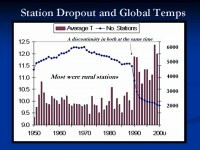 Average temperatures for the station categories jumped when the stations dropped out, suggesting that it was mainly the colder stations that were no longer in the record. The global data bases all set up grid boxes globally and populate the temperatures for the box using data from within that box or now with many empty boxes using the closest stations weighted by distance in nearby boxes. Thus a box which had rural stations, will find temperatures now determined by urban areas in that box or distant boxes. This is why the global data bases suggest the greatest warming has been in Siberia. Also a factor is that in the FSU era, the cities and towns temperatures determined allocations of funds and fuel, so it is believed that the cold was exaggerated in the past introducing an artificial warming. See the details of these numerous data integrity issues here. 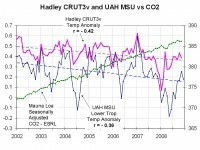 The Hadley monthly and UAH MSU monthly lower tropospheric temperatures are shown. Both show cooling (0.2C (0.3F)) for MSU and (0.15C (0.25F)) for Hadley. Note the significant NEGATIVE correlation of temperatures with CO2. Anomaly differences come from the base period to compare to and compute anomalies. The Hadley used 1960 to 1990 and the satellite centers 1979-1998. Satellite microwave sensing is not subject to any of these problems and provides full global coverage. It integrates local warming due to urbanization. It is as a result is the most reliable and trustworthy. Unfortunately the data extends only back to 1979. Nonetheless, you can use the above to conclude this past year was not the 10th warmest year as the alarmists are claiming. Read more here. And just wait for the next few weeks in the United States and southern Canada. Would you believe 0F or below even in some big eastern cities and plenty of snow? Frost or freeze into Florida and hundreds of records will tumble in the south. (PREDICTION: First sub-zero day Friday in New York City since 1994). This will help start 2009 on a cold note like 2008. The UKMO which hasn’t got it right in a generation already are calling for a top 5 warmest year. These issues also address the ridiculous claims and logic in this post.